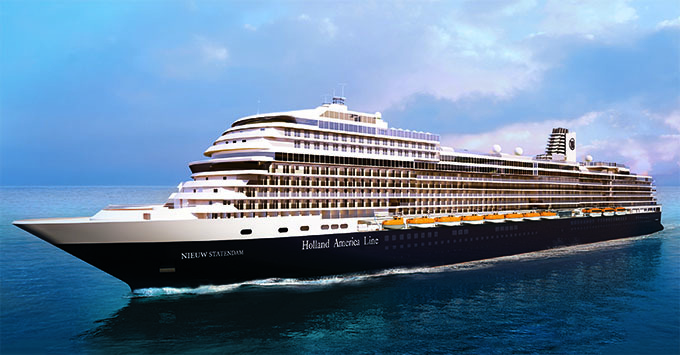 (4:58 p.m. EDT) -- Holland America Line's next new cruise ship, Nieuw Statendam, is just six weeks from its maiden voyage, and we're at the shipyard in Venice to get a preview before its debut. Nieuw Statendam is the line's second Pinnacle-class ship -- and almost identical to Koningsdam -- with hallmarks such as the Music Walk, World Stage, Rudi's Sel de Mer and Blend carried over. There's one surprise: Club Orange -- a new program for Neptune-suite passengers and guests of any cabin category who purchase a pass -- that features a specialty restaurant at breakfast and dinner and a concierge hotline. The 2,666-passenger ship will also offer eight extra cabins than Koningsdam, plus larger suites and a redesigned Neptune Lounge, which is reserved for suite-class passengers. While we didn't get to see the suites or Neptune Lounge on our tour, we did get to see most public spaces of the ship. Here's some more things to expect for Nieuw Statendam, based on our shipyard tour. 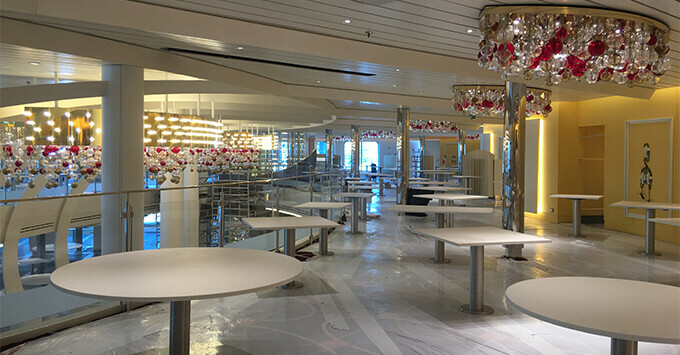 Yes, the main dining room is identical to the one on Koningsdam, but it's a showstopper. We were lucky to see a near-finished room -- just missing the furniture and soft furnishings -- and the space feels elegant and looks beautiful. There's no Culinary Arts Center on Nieuw Statendam. In its place, the line is introducing Club Orange -- a specialty restaurant offered to suite-class passengers and guests of any cabin category for a fee. The new program offers other perks, too, such as a concierge hotline and priority tendering. Culinary Arts Center seems popular on Koningsdam, though, so it's a shame it won't feature on Nieuw Statendam. 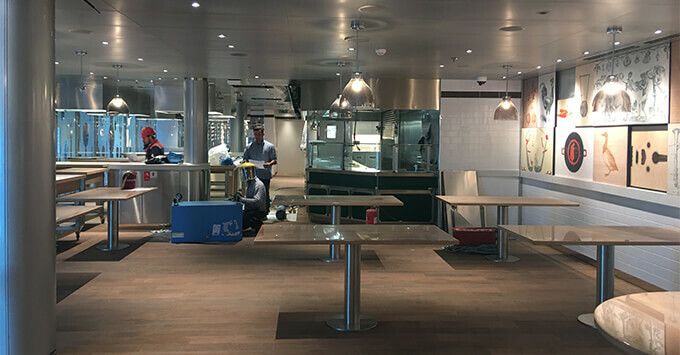 The line has alluded to America's Test Kitchen demos taking place in the World Stage (they currently take place in the Culinary Arts Center on Koningsdam), but this hasn't been confirmed yet. Music Walk or Cruise Ship Lounge? 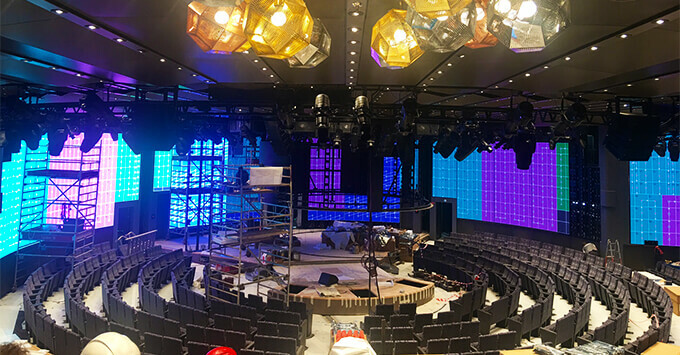 While some changes have been made to the Music Walk concept on Nieuw Statendam -- like the addition of the Rolling Stone Rock Room -- passengers might find it hard to distinguish between each musical space, which also includes Lincoln Center Stage, B.B. King's Live and Billboard Onboard. Music Walk is open plan, just like on Koningsdam, and as a result it doesn't feel like each venue has its own identity. We wonder if the line has missed an opportunity to create more separate, individual spaces for each venue on Nieuw Statendam. We're curious to see the reaction to Rolling Stone Rock Room when the ship launches. The "venue" is spacious and well laid out -- with a large dance floor in front of the stage and plenty of seating -- but we'd like to see some connection to the line's partnership with Rolling Stone -- such as dedicated artwork or signage. The line's clever move to relocate Lincoln Center Stage means passengers won't hear the sound of the casino echoing in the background -- as is sometimes the case on Koningsdam. We love the look and feel of the kids' club and can't wait to see it in action. Club HAL is located on Deck 10 and is divided up to separate the different age groups. The space provides tons of natural light and wonderful views of the ocean. It's also bright and colorfully decorated -- just as it should be to suit its audience. Just like the main dining room (and most other spaces on the ship), World Stage is almost identical to the one on Koningsdam. 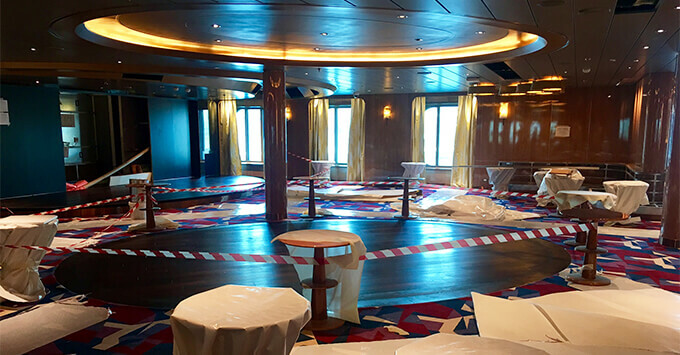 The line has scrapped the seating boxes around the side -- which were unpopular and under-used on Koningsdam -- and added 100 more seats so the venue can fit 800 passengers. The seats still feel large and roomy, and the space doesn't feel squeezed. World Space is beautifully designed with Tom Dixon-inspired lighting and that incredible 270-degree screen remains the focal point of the room. What's Next for Nieuw Statendam? The ship is roughly 85 percent complete and is now entering its final stage of construction. 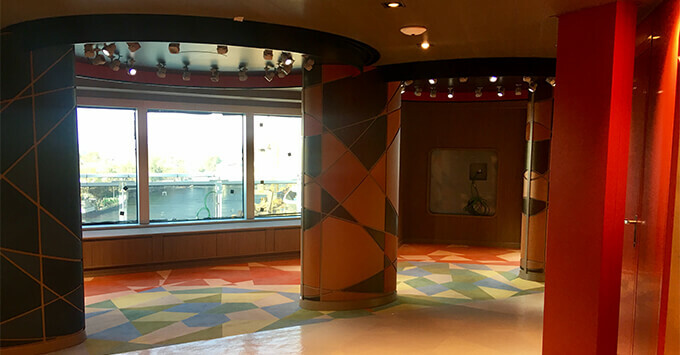 The finishing touches -- such as soft furnishings and a $4.1m art collection -- will be added in the coming weeks before the ship is officially handed over to the line at the end of November. The ship makes its first passenger sailing on December 5 with a 14-day transatlantic crossing. Nieuw Statendam will then offer Caribbean cruises from Fort Lauderdale during its maiden season, before repositioning to Europe in May 2019.